People at Judkewitz lab tend to do really cool stuff. This time they have implemented a binary phase modulator using a DMD. The controlled modulation of an optical wavefront is required for aberration correction, digital phase conjugation, or patterned photostimulation. For most of these applications, it is desirable to control the wavefront modulation at the highest rates possible. The digital micromirror device (DMD) presents a cost-effective solution to achieve high-speed modulation and often exceeds the speed of the more conventional liquid crystal spatial light modulator but is inherently an amplitude modulator. 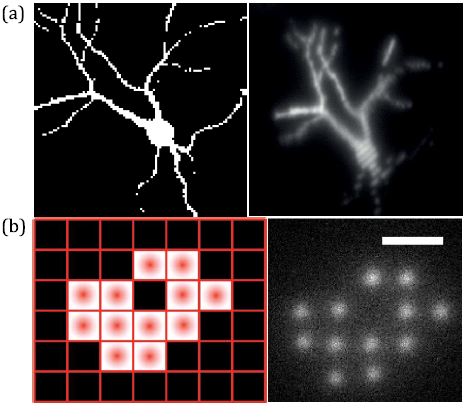 Furthermore, spatial dispersion caused by DMD diffraction complicates its use with pulsed laser sources, such as those used in nonlinear microscopy. Here we introduce a DMD-based optical design that overcomes these limitations and achieves dispersion-free high-speed binary phase modulation. We show that this phase modulation can be used to switch through binary phase patterns at the rate of 20 kHz in two-photon excitation fluorescence applications. Controlling phase is of paramount interest in multiple optical scenarios. Doing it fast is very difficult, given that spatial light modulators that are really good at modulating phase precisely tend to be slow (~hundreds of Hz). On the other side, intensity modulators such as DMDs are very fast (~20 kHz), but they cannot directly modulate phase. There have been several workarounds with the general idea of using DMDs to modulate phase. I remember a very nice paper by A. Mosk, using groups of mirrors to codify the phase of a superpixel. 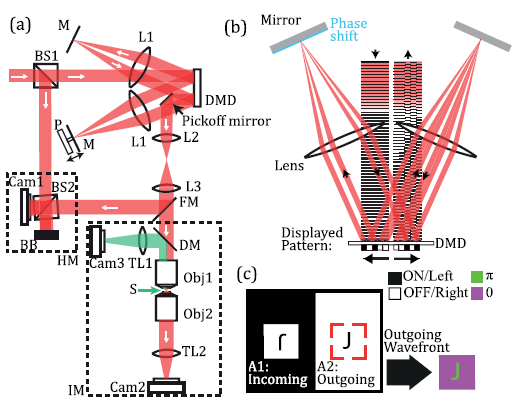 Here, they use the fact that DMDs reflect light in two different directions to introduce a phase shift with a moving mirror into one of the reflection directions, achieving binary phase distributions at kHz refresh rates. Seems like we are getting closer and closer to get a high-efficiency method to modulate phase with DMD’s.